Most biological discoveries can only be made in light of evolution. In particular, functional annotation of genes is usually deduced from the orthology, paralogy, or xenology relations between genes, which are inferred from the comparison of a gene tree with a species tree. As sequence-only gene tree reconstruction methods often do not allow to confidently discriminate between trees, recent “integrative methods” include information from the species tree. The idea is to consider, in addition to a value measuring the fitness of a tree to a sequence alignment, a measure reflecting the evolution of a whole gene family through gene gain and loss. One such measure is the “reconciliation” cost, i.e., the cost of a gain and loss scenario explaining the incongruence between the gene and species tree. 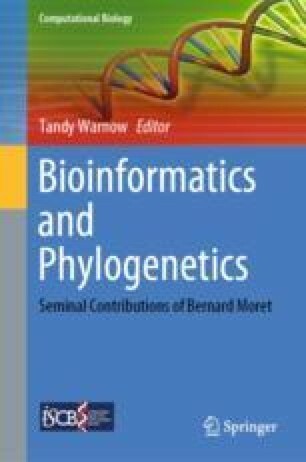 This chapter begins with a review of deterministic algorithms for computing reconciliation distances under various evolutionary models of gene family evolution. We then review integrative methods for correcting a gene tree, based on various strategies for exploring its neighborhood. The considered algorithms are those based on polytomy resolution, tree amalgamation and supertree reconstruction. The goal is to provide a comprehensive overview of existing methods with algorithms presented in concise form. The reader is referred to original papers for more details and proofs of complexity. The authors acknowledge the support of the Fonds de Recherche du Québec Nature et Technologie (FRQNT) and of the Natural Sciences and Engineering Research Council (NSERC) (Discovery Grant RGPIN-249834).